Tony Strachan launched our booklet, Celebrating Conservation and Change in Glebe, on 17 April, 2009. He was introduced by our President, Lesley Lynch. Here are edited transcripts of their talks. Tony Strachan has an extraordinarily deep engagement in the history of all the good things that have happened in the conservation movement in NSW and in the preservation and conservation of Glebe. As somebody who lived in Glebe in the 60s and knew a few developers who were going to make fortunes, one can only say thank God that in the 70s people rolled in, in a very big way, and put a lot of that stuff on hold. In the 70s we had a concept of conservation that was a bit different from the broad concept we have today. Tony was one of the people who had significant impact on that. He wrote in the early 70s an article for an ANZAAS Congress on ‘Redevelopment or Rehabilitation’. I’m told by many people that this was a pretty important article in the development of concepts during the 70s. Also the Glebe Society was a big supporter of the National Trust move beyond the individual building to environments, groups of houses and townscapes and Tony was a very big player in that movement and also a significant person in getting Glebe’s current status as a conservation area. We should all bow and say a huge ‘thankyou’ to Tony. The other very big thing that Tony had a hand in was in the preservation and the remaking of the Glebe Estate rather than obliterating it. He was a young man then. People say that it is only in our transition to our golden era that we get involved in such things. Tony says he had a lot of energy then as he was only on his early 30s. He’s a very worthy person to say a few words about what we’re calling a contribution to the Glebe Society’s cultural infrastructure. I joined the Glebe Society in late 1971 so I’ve been a member for most of the 40 years. I regard my time here as one of the great highlights of my earlier life. The early 70s were such an exciting time if you were interested in these things. When I reflect back at how much energy I did have at that time I am quite astonished. I was running my business, I was restoring my house, I was president of the Civic Design Society of the University of NSW, I was first Chairman of the Total Environment Centre and then I became Chairman of the Urban Conservation Society of NSW and of course I was on the planning committee of Leichhardt Council. I was just one of many and I would like to stress just how many people were working at that time. Glebe was very fortunate to have a number of people who were talented and really interested in what was happening. Although it is mentioned in passing in your admirable new booklet, the effect of what happened in Glebe was quite pivotal to what happened particularly in Sydney but also in NSW and Australia. The three really important issues of the time, from the late 60s to the early 70s were the expressways, what was going to happen to the Glebe Estate and the whole town planning issue. You can talk about them separately, but effectively of course, they all really came together. When Tom Uren was persuaded to buy the Glebe Estate, it was quite obvious that the Church was just not interested in conservation, they just did not understand the whole idea. But when Tom Uren undertook to do that, he changed the face of public housing in this state. He didn’t do it deliberately, but effectively that’s what flowedthrough. So the sorts of high rise towers that had been erected and were still going up in Redfern and of which of course Melbourne had many many more examples, were stopped. The proposed redevelopment of Waterloo was stopped. The public housing which occurred later in Waterloo all came back to this whole idea of saving historic streetscapes in Glebe, allied with the social idea that this was an important thing to do because of the people who lived there and the people who would live there in the future. This all came back to that. So the people of Glebe can be congratulated for lots of things that happened over this time and that was one of the most significant. But the other one was that Glebe was in the line of fire of the so-called expressways. If they had been built they would have almost destroyed the whole suburb, because over 1000 houses were going and it would have been the end of Glebe, quite frankly. So terrific efforts were put into that but of course efforts were being made elsewhere in Sydney. When Tom Uren said ‘yes we will buy the Glebe Estate’, of course the biggest expressway of all was going straight through the middle. So how could the State Labor government say ‘I’m sorry, but we’re going to put an expressway through what you’ve just bought as historic housing’. Ultimately it did take until 1977 but they backed off completely. It was part of this whole process of a complete rethink of what planning was all about and what conservation was all about. Up until 1960 or until the Paddington Society started, in 1964, this whole notion of conservation was an airy fairy thing in a few people’s heads. When the National Trust was formed, they were only interested in the conservation of houses up to, do you believe it, 1830. This whole idea that the Victorian era had some houses of significance took a long while to sink in. But it really did sink in earlier in Australia than it did in, say, Britain. I went to live in England in 1964 and they weren’t interested in saving Victorian buildings in Britain at that time. But Australia had become interested in saving them. So you have to realise what a revolution in attitudes this all was. When the expressway scheme was proposed in the very late 1940s all of the inner city was regarded as somewhere that had had its time and would go. It was a wonderful time to be around in the early 70s, it was wonderful to be in Glebe and terrific to be working with other people with similar ideas. In a minor way, but also a quite important way, in terms of how this city came to be regarded, we really did change the world. It’s wonderful to see the Glebe Society so strong after all these years. It’s just fascinating to see what a local group can do. At that time there were a number of groups, particularly in Leichhardt and they were pivotal to getting town planning changed. When the Leichhardt Council was effectively taken over by the Glebe Society and the Balmain Association, everything changed. We broke the mould in 1974 and employing people like Penny Pike on the town plan and we had a wonderful planning compermittee with people like David Chesterman. It was such an exciting thing to do, to think that we were creating a future which had relevance from the past but was looking to the future in a very positive way. Glebe is incredibly well documented but I think one day there will be other studies, particularly to do with the way that planning changed as a result of what happened in Glebe and Leichhardt. And going back to my earlier theme of the effects of things being felt elsewhere, the change in Leichhardt Council in 1974 was the first time that this had happened. 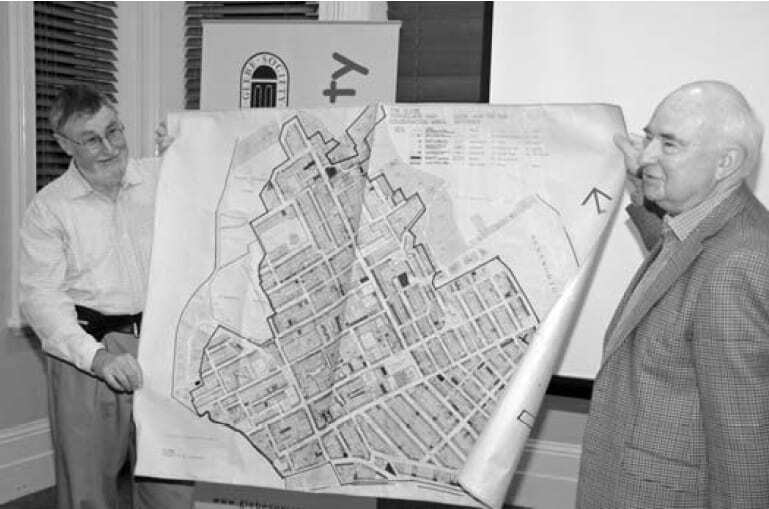 This was a revolution – the whole idea of open council, of a Planning Committee on which the locals could participate, and by the way, to develop that new town plan, we had enormous public participation. We had meetings all over the municipality. 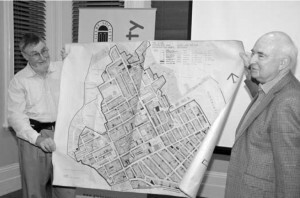 We had all sorts of ideas thrown up and we had a wonderful town plan by the end of 1975. Essentially what is in the present plan does go back to then. The basis of it was established then. If you are going to conserve a suburb with reference to the future you have to have strictly practical things. There was lots of debate at the time but in essence the ideas of the time effectively came to prevail. I have here a duplicate map of the 1974 conservation area plan that we had for Glebe. At the time, colours were colours. So what did we use green for? Buildings that should be pulled down. So green had no significance as a colour. This map should go into the archives of the Glebe Society at this stage. I’d like to congratulate the Glebe Society for producing this small historical survey of what’s been happening. I congratulate the present executive and members of the Glebe Society on its 40th anniversary. Everything that the Glebe people wanted in 1969, all the important things, were accomplished. Now vigilance is necessary to make sure that all those issues are still observed and those details are followed through.